Nokia, the largest handset manufacturer in the world and the leading handset seller in India is all set to launch its own stores. FDI guidelines were changed in 2006 to allow foreign companies set shop in a single brand retail stores. The foreign company can hold 51% and has to tie-up with and Indian partner. Nokia chose HCL – smart choice. India already has around 400 million mobile users and is adding 10 million users per month. That is a incredible demand for handset’s. Yet handset retailing hasn’t taken off as it should. There are few exclusive mobile retail chains like the Mobile Store and UniverCell. There are few localized chains like Sangeeta. Many malls like Big Bazaar and electronic retails like eZone and Croma are selling cell phones. Even Subhiksha sells mobile phones but you know how it goes. But, no one has pan India presence. Mobile Store has around 1400 stores all over India and recently took over Spice group’s mobile retail chain. Which is good but not enough and this is the reason why Nokia has a tremendous growth potential in its retail venture. Nokia is leading the Indian mobile space for a while now. No one understands Indian market better than Nokia. It even tried out a touch screen phone to compete with Apple’s iPhone. And guess what, it is a smashing success. 17 million iPhone’s were sold so far. 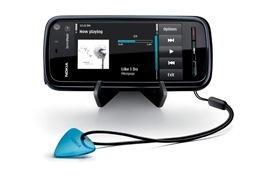 Nokia XpressMusic 5800 has already sold 13 million. Reason is simple, 5800’s cost is less than iPhone’s cost and 5800 performs the same function and sometimes more. Nokia is already a recognizable brand and people will flock to Nokia stores. It will be offering a host of other services as well. It will be selling its luxury brand Vertu and also its Ovi services. The only thing that might be missing in Nokia’s stores are other company phones. When people want to buy a phone they would like a choice. That would be missing in Nokia stores. What do you think would be the fate of Nokia store and mobile retail chains in general? Yes, We desperately need them – The Solar Powered Rickshaws. Oracle to buy Sun. Should we look for a new database? Android App Market goes past Apple Store for Free Mobile Apps! Airtel to offer Iphone 3G at 18500? – Rumour, April Fool joke, you decide! This model is Nokia 808.41 MP camera is a big advantage.The cost around 32000 for distributor price and 34000 is MRP. Dont know what use it is going to serve. Because of a non compete agreement with its other distribution channles, phones may be sold at MRP and the value based consumer is going to go in there for sampling the phone and then go a dingy old place to get the same phone at a more realistic price. Very few retailers have had success with their stores and I can only think about Apple which has had considerable success. On the other hand they could try their hands on experience centers, where people get to try their hands on the latest things and make the decision. The distributors definitely lack in this space as they only allow people to play with dummy phones and not the real things.